In the hierarchy of great movie chase sequences, the recent landmarks include the chases under the Brooklyn elevated tracks in "The French Connection" down the hills of San Francisco in "Bullitt" and through the Paris Metro in "Diva." Those chases were not only thrilling in their own right, but they also reflected the essence of the cities where they took place. Now comes William Friedkin, director of "The French Connection," with a new movie that contains another chase that belongs on that short list. The movie is set in Los Angeles, and so, of course, the chase centers on the freeway system. "To Live and Die in L. A." is a law-enforcement movie, sort of. It's about Secret Service agents who are on the trail of a counterfeiter who has eluded the law for years, and who flaunts his success. At one point, when undercover agents are negotiating a deal with the counterfeiter in his expensive health club, he boasts, "I've been coming to this gym three times a week for five years. I'm an easy guy to find. People know they can trust me." Meanwhile, he's asking for a down payment on a sale of bogus bills, and the down payment is larger than the Secret Service can authorize. So Richard Chance (William L. Petersen), the hot- dog special agent who's the hero of the movie, sets up a dangerous plan to steal the advance money from another crook and use it to buy the bogus paper and bust the counterfeiter. Neat. The whole plot is neat, revolving around a few central emotions - friendship, loyalty, arrogance, anger. By the time the great chase sequence arrives, it isn't just a novelty that's tacked onto a movie where it doesn't fit. It's part of the plot. The Secret Service agents bungle their crime, the cops come in pursuit, and the chase unfolds in a long, dazzling ballet of timing, speed and imagination. The great chases are rarely just chases. They involve some kind of additional element - an unexpected vehicle, an unusual challenge, a strange setting. The car-train chase in "The French Connection" was a masterstroke. In "Diva," the courier rode his motor scooter into one subway station and out another, bouncing up and down the stairs. Or think of John Ford's sustained stagecoach chase in "Stagecoach," or the way Buster Keaton orchestrated "The General" (1927) so that trains chased each other through a railway system. 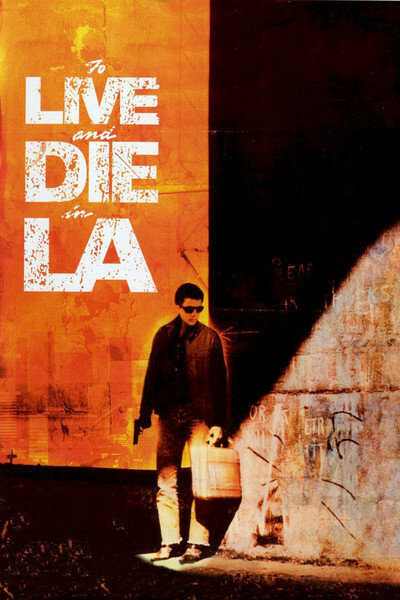 The masterstroke in "To Live and Die in L. A." is that the chase isn't just on a freeway. It goes the wrong way down the freeway. I don't know how Friedkin choreographed this scene, and I don't want to know. It probably took a lot of money and a lot of drivers. All I know is that there are high-angle shots of the chase during which you can look a long way ahead and see hundreds of cars across four lanes, all heading for the escape car, which is aimed at them, full speed. It is an amazing sequence. The rest of the movie is also first-rate. The direction is the key. Friedkin has made some good movies ("The French Connection," "The Exorcist," "Sorcerer") and some bad ones ("Cruising," "Deal of the Century"). This is his comeback, showing the depth and skill of the early pictures. The central performance is by William L. Petersen, a Chicago stage actor who comes across as tough, wiry and smart. He has some of the qualities of a Steve McQueen, with more complexity. Another strong performance in the movie is by Willem Dafoe as the counterfeiter, cool and professional as he discusses the realities of his business. I like movies that teach me about something, movies that have researched their subject and contain a lot of information, casually contained in between the big dramatic scenes. "To Live and Die in L. A." seems to know a lot about counterfeiting and also about the interior policies of the Secret Service. The film isn't just about cops and robbers, but about two systems of doing business, and how one of the systems finds a way to change itself in order to defeat the other. That's interesting. So is the chase.